The application is open until December 1, 2016. This Topical Workshop will bring together the expertise of scientists on high-energy-physics, lattice calculations and scientists exploring the route toward quantum lattice calculations. The bridge between this two communities will surely be beneficial to the current research program indicating possible critical aspects, and unveiling new ideas and approaches based on decades of experience in lattice calculations. 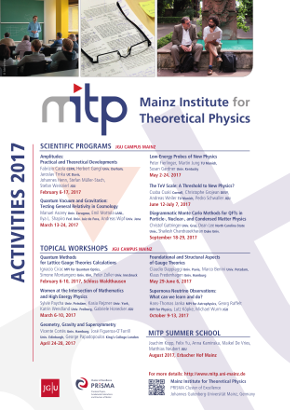 The development of theoretical and numerical quantum information tools to study Lattice Gauge Theories (LGTs): sophisticated numerical simulations performed on classical computers mainly based on - but not limited to – matrix product states and tensor networks, which were originally developed in the context of quantum information science and have arisen as promising alternative numerical tools to address challenging questions in strongly correlated condensed matter and in LGTs. The development of the theoretical tools to design, develop and verify quantum simulations of LGTs and the implementation of experimental proof of principle quantum simulations of LGTs. While it is currently unclear which combination of theoretical approach (Wilson's LGT or quantum link models), numerical method (hybrid Monte Carlo, cluster algorithms), and experimental quantum technology (ultracold atoms, trapped ions, or superconducting circuits) is best suited to solve these challenging problems, current research aims at shedding light on these fundamental questions.